I have a question about ports, it there any differences between a round port and a slot port? Also I have been looking around online at box design and notice people using square ports in the middle of the box, is the any reason for square ports? Functionally there is no difference between a round port and a rectangular vent of the same area. It is often easier to find more area for a rectangular vent and to make them longer than a round port. ^ For sure. The more square the better. ok thanks guys the reason I'm asking is I have to build a new box and wanted to go with a rectangular vent rather then round this time around. Any help would be great in designing a new box/amp rack. We just had a baby boy and now I need the back of my van for the stroller so I need to build a new box that is smaller but still can use my two 10" subs. Right now my box is 48" wide X 14" high X 12" deep, I would like to make a smaller one but not sure on how to design the box, amps rack and still have room for the stroller also. I have 40" high X 15" deep to play with, the stroller is 21" wide. Would like to box to be 23" wide and no wider, so I still have room for the stroller and baby bag. Should I face the subs on the side of the box and the vent to the back? OR Subs and vent facing the rear? I was also thinking of trying the sell the 2 10" and box and just getting a single 12" 0r 15" sub. I'm runing 2 X Earthquake dbx10 and a Alpine MRD-M1000 @ 2 ohms so around 1000 watts rms @ 14.4 volts, and a Earthquake PH120.2 for the fronts stage. Here my set up now. Last edited by Robertjr79; 12-20-2011 at 03:36 PM. I would think you'd generally get much better results having the port and subs facing the same way, and towards the rear. i had a large side firing port on two kickers for a short time and absolutely hated the sound. Edit: Just saw the picture- You might actually be better off facing forward since they're up against the back of a pretty spacious vehicle, definitely experiment. Last edited by Colton; 12-20-2011 at 05:06 PM. So subs and vent up? Right now it sound pretty good and i like it but I need the room. I'm just not sure on how to design the box. The box I'm using now is pretty basic box and it was easy to build. Here what it sounds like now. my voltage dropped around 13.3 volt but I was just idling to make the video when driving I see in the low around 14+. Will make a video of me driving around with the voltage drop. 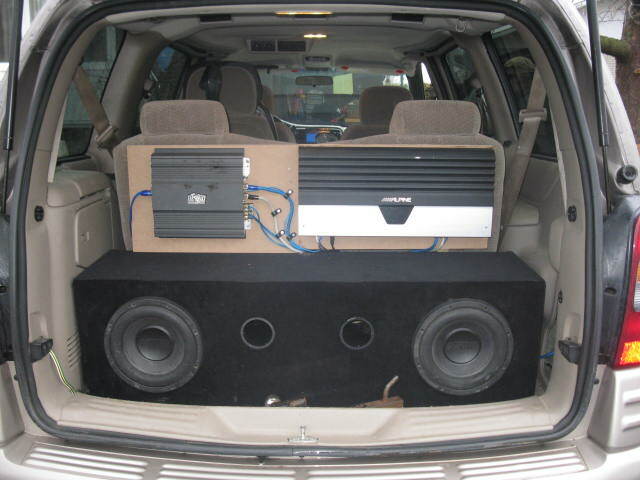 Stack the woofers with a slot vent on the bottom, all facing back. Should leave you lots of width. ok here what I came up with for the box, what do you guys think? Its 3.4 cu.ft before port, sub disp. I would like to keep it close to 3 cu. ft.
Never did a slot port before so the port will need a bend in it, so do I cut 16.5" X 11"" and 16.5" X 20.75" for the back wall to make the 32.5" long? I need to keep the port 3" wide on the back wall also right? Last edited by Robertjr79; 12-22-2011 at 03:38 AM. ^ Yes. The only thing that's maybe questionable is the tuning. It's pretty low - is it still above the Fs of the woofer?